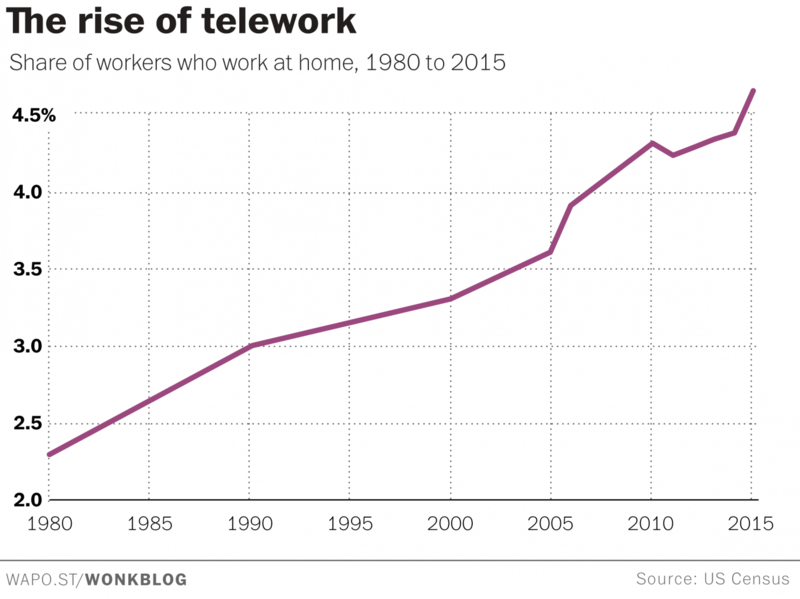 New numbers from Gallup show that remote work is becoming more common. Workers today are more likely to spend at least part of their time working apart from their colleagues. And the share of time that these workers are spending out of the office is getting larger. The Gallup numbers are the latest evidence of a trend that's been visible in Census data for a number of years now. About 4.6 percent of workers, or 6.8 million of them, worked at home in 2015, the latest year for which Census has data. That's a nearly 5 percent increase over 2014. Remote work is the bright spot in an otherwise gloomy landscape for commuters. According to the Census, the typical American commute has been getting longer each year since 2010. The Census's 2015 American Community Survey data, released last fall, show that the average American commute crept up to 26.4 minutes in 2015, or about 24 seconds longer than the previous year. Multiply it all out -- 24 seconds per commute, twice a day, five days a week, 50 weeks a year -- and in 2015 the typical American could expect to spend about three hours and twenty minutes longer getting to and from work than in 2014. 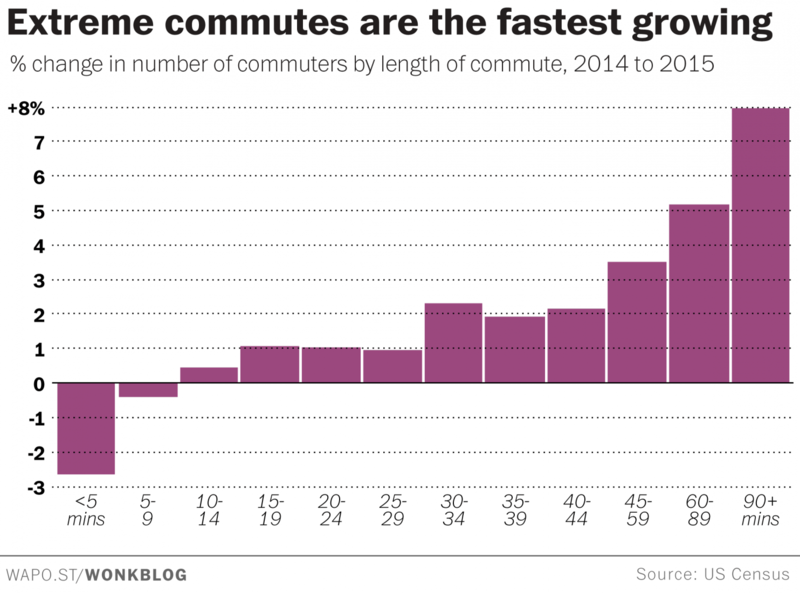 The Census data show the longest commutes are also the fastest growing. The total 16-and-over workforce -- from which these numbers are derived -- grew by roughly 1.7 percent from 2014 to 2015 (148.3 million workers). But the number of workers with 45-minute commutes grew even faster (3.5 percent). The number with hourlong commutes grew even faster than that (5.1 percent). And workers with extreme commutes -- 90 minutes or more -- grew by the fastest rate of all (8 percent). At the other end of the spectrum, the number of workers with commutes under 10 minutes actually shrank. There are a number of factors driving this trend -- Americans' decades-long shift toward the suburbs, among them. A Brookings report found that, even as jobs followed them toward the edges of metropolitan areas, the sprawl of suburban and exurban areas led to longer commutes. The number of jobs within a typical commute distance fell by 7 percent between 2000 and 2012, according to the report. That trend has continued in the years since, said Adie Tomer, an infrastructure researcher at the Brookings Institution. "We continue to see specific metro areas either grow outward, or just outright add population," Tomer said. Much of the housing being built to accommodate those new residents is of the suburban, low-density variety -- "what that's doing is pulling housing and jobs further apart." Another factor, Tomer says, is an increase in solo car commuting and a decrease in carpooling, particularly since the 1980s. "We really shifted to this 'I'm gonna travel alone'" mode of thinking about our commutes, Tomer says. There's a massive body of social science and public health research on the negative effects of commuting on personal and societal well-being. Longer commutes are linked with increased rates of obesity , high cholesterol , high blood pressure , back and neck pain , divorce , depression and death . At the societal level, people who commute more are less likely to vote . They're more likely to be absent from work . They're less likely to escape poverty . They have kids who are more likely to have emotional problems . 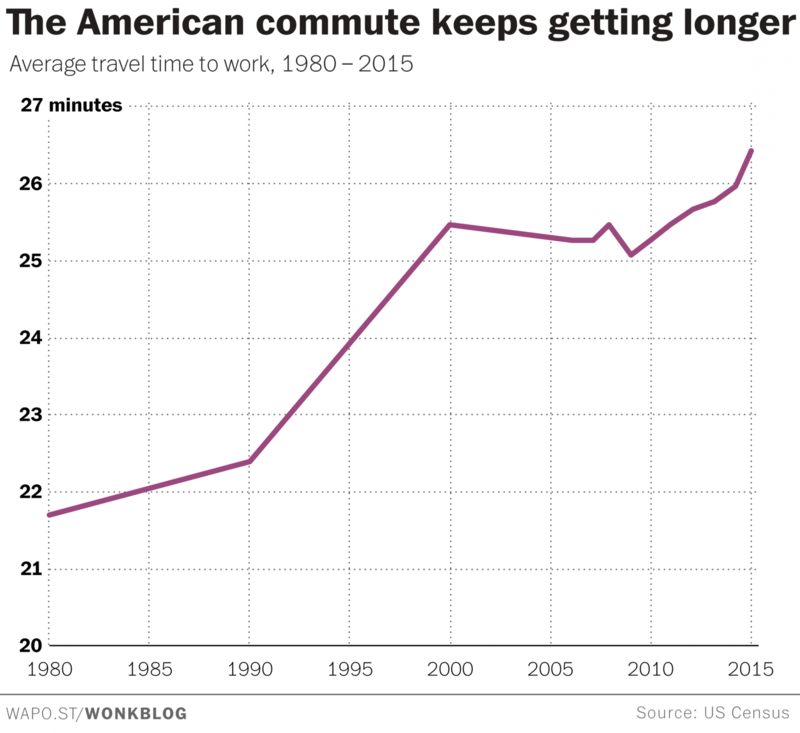 The increase in commute times "is one of the most powerful indictments of our daily American experience," Tomer said. People don't want to live farther away from work, but they also don't want to give up on the ideal of the detached single-family home with the big yard. "People don't want a longer commute, but faced with a choice people will choose that lawn," Tomer said. If there's any bright spot, it's that a number of workers appear to be breaking out of these trends by making smarter use of remote work possibilities. Gallup's numbers showing that employees who spend three or four days working from home are most engaged with their jobs suggest it's good for their employers, too.